I did the 1.5 hour Liberty Reclaimed: History of the Village walk (which is near my 'hood) with Heritage Toronto this afternoon. Liberty Village is bordered to the north by King Street W, to the west by Dufferin Street, to the south by the Gardiner Expressway, and to the east by Strachan Avenue. There were about 60 of us. Kadi, a Heritage Toronto board member, welcomed everyone. Natalie and Shayda were our volunteer tour guides. They gave us lots of interesting information. The walk started at Massey Harris Park (King Street W/Crawford Street). Massey Ferguson was founded in 1847 in Newcastle, Ontario, by Daniel Massey. Daniel's eldest son, Hart, renamed it the Massey Manufacturing Company of Toronto and moved it to Toronto in 1879, where it soon became one of the city's leading employers. 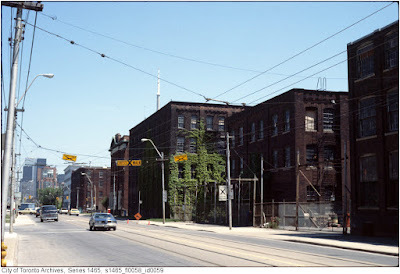 The massive collection of factories consisted of an 11 acre site with plant and head office at 915 King Street West (built in 1899 by E.J. Lennox) ... it served as head office for Massey Harris (formed in 1891 from the merger of Massey Manufacturing Company and Alanson Harris, Son and Company Limited of Brantford and later Massey Ferguson). It remained in use by Massey Ferguson until they moved in the 1970s and became vacant when the company ceased operations in the early 1980s. The structure was converted in 2003 to condos while the other buildings, including the plant, were demolished. Massey Harris Park is located next to the lofts. At the next stop, Shayda talked about how immigrants spent time in the Strachan Avenue/Douro Street area when they arrive in Canada. It was handy to the lake and the train tracks. Our third stop was where the former Inglis plant used to be (Strachan Avenue/East Liberty Street). In September 1881, John Inglis purchased a large triangular plot of land and moved the company there from Dundas, Ontario, renaming it John Inglis and Sons. 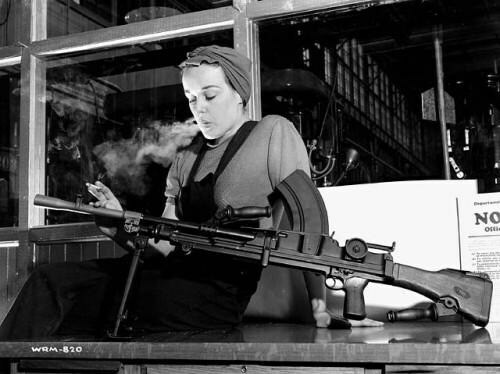 Ronnie the Inglis Bren Gun Girl (to encourage women to work at Inglis) predated Rosie the Riveter by two years. We then proceeded to the Toronto Central Prison Chapel Prison. The prison was a 336-bed facility opened in 1873. It was intended as an industrial facility and began with the manufacturing of railway cars for the Canada Car Company. 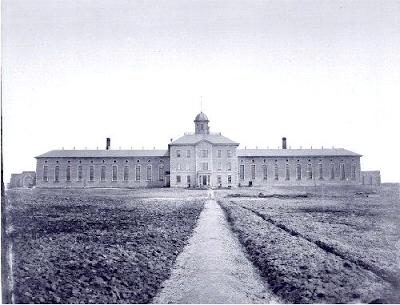 Hard work and discipline were considered the best forms of rehabilitation and active industry would raise money for the prison. The Toronto Central Prison Chapel is an 1877 former Roman Catholic prison chapel and is the last remaining building of the Toronto Central Prison complex. The chapel was built by prisoners of the prison. It was added to the city's list of heritage properties and is protected from demolition. We headed west on Liberty Street and learned about how artists had been in the buildings that now house the Liberty Market. Now there are restaurants, stores and businesses. The industrial building that used to house a paper company and up until 2003, the Irwin Toy Factory, was converted into condos and mixed commercial use spaces. We continued west on Liberty Street. The final stop on the tour was where the Andrew Mercer Reformatory for Women, the first women's (16 years of age or older) prison in Canada, once stood. Under the Ontario Female Refuges Act, 1893-1964, any person, including any parent or guardian, could bring before a judge any female under the age of twenty-one years who were deemed unmanageable or incorrigible by the adult person. One of the missions was to instill feminine Victorian virtues such as obedience and servility but there were reports of torture and beatings. 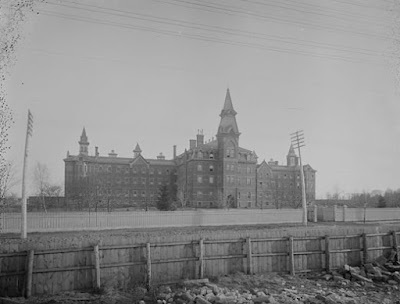 In early 1969, the reformatory was closed and demolished later that year. 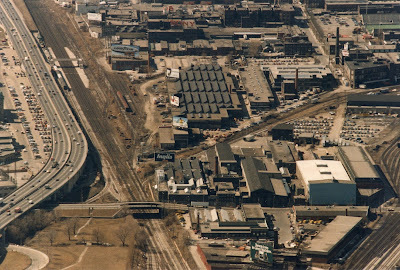 It was replaced by Lamport Stadium about five years later. Here's my walk back along Liberty Street after the walk. I like doing these kinds of tours because I always learn something. 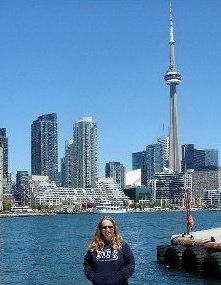 The Heritage Toronto tours are free but donations are appreciated. There's one more Liberty Village walk coming up at the end of September and I'd suggest you check it out.